The baking skills of Pigsticks’ timorous buddy, Harold, come in handy when an out-of-control time machine sends the two careening through history and prehistory. 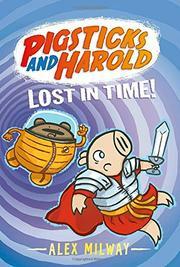 The mismatched pair’s fourth outing takes a not-entirely-unexpected turn when Pigsticks, impulsive as ever, breaks the handle off a time machine invented by his brilliant great-aunt Ada Lovepig. Suddenly the two find themselves surrounded by glowering dinopigs. They escape for quick, nonchronological encounters with Cleopigtra, Julius Squealer, London in flames (“What’s so great about this fire?”), and builders constructing the Statue of Pigerty before they are seized by Hamfrida the hamster’s Viking minions, whose frightening cries—“GLOOM! DOOM! DENTISTS!”—portend permanent exile in the past. With a simplicity that stands in droll contrast to the narrative’s sophisticated cast, Milway illustrates these misadventures with thick-lined cartoon views of the animal cast in assorted historical dress and settings. Happily, a taste of Harold’s delicious Battenburg cake converts the Vikings from foes to friends. Better yet, a final twist brings the time travelers a spaceship from the future…so it’s interplanetary party time!